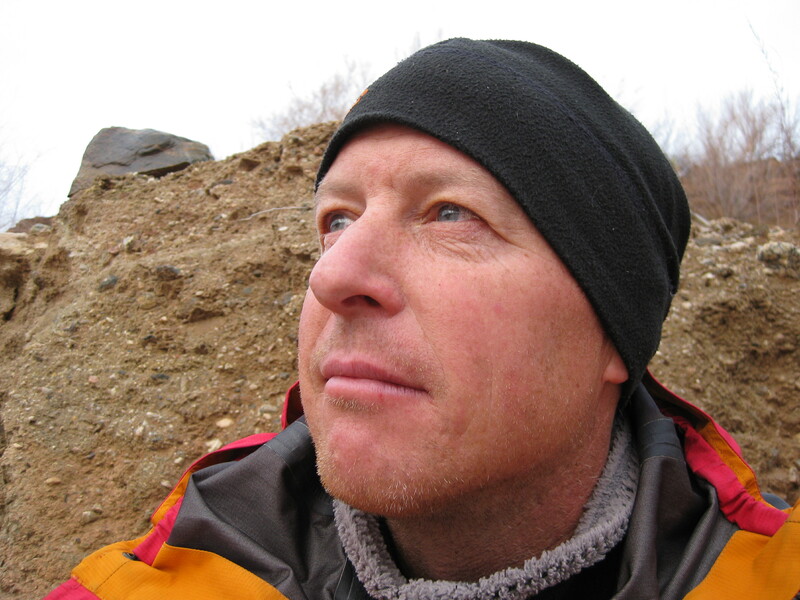 On January 12, 2010 I faced one of the most difficult mental challenges of my life. Trying to leave the boat ramp at Lee’s Ferry with my sweetheart Katie standing on the shore proved to be a monumental obstacle. I kept reminding myself before the trip that all I had to do was push off from the boat ramp. How hard could that be? Well, at 4:42 pm I finally shoved off and started my 297 mile journey, alone. I cried as I bobbled down the Paria Riffle. My mind didn’t quite know how to wrap itself around what I was doing. It felt right, but damn this was a huge thing I had started. The biggest unknown for me was spending that much time alone. I felt really solid about everything else. This was my fifth time rowing a boat down there and my third January 12th launch date in a row. I knew sort of what to expect with the short days and minimal direct sunshine. Turns out, however, I would get to experience the third biggest storm in Flagstaff’s history. (The other two were in 1915 and 1967.) The South Rim at Grand Canyon received 55 inches of snow in a five day period! I had recently bought a 36 inch Paiste Symphonic Gong and figured that the sound would compliment the inner canyon walls. I played the gong in the back of Redwall Cavern. The acoustics were phenomenal and I played for hours grinning ear to ear. I also played below Lava Falls on the full moon. I played for nearly 4 hours with minimal breaks. 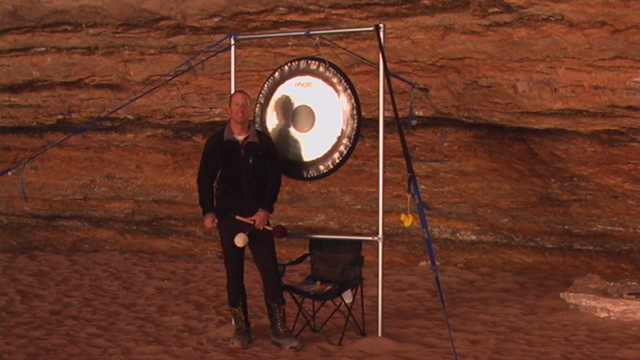 The bottom of Grand Canyon is quite possibly the best place on the planet to experience a gong. It may very well even be the first time a gong has been played down there. I don’t know. I had the river to myself for the first 83 miles. It wasn’t until day six that I ran into another group just above Phantom Ranch. I camped just upstream of them at Upper Cremation Camp. They invited me to their fire and I chatted with them for a couple of hours before retiring back to my camp. It was nice to talk to somebody without racking up the Sat Phone bill! The first rain drops of my trip began during the middle of the night. After talking with Katie and Craig on the pay phone at Phantom, I began what would end up being the best day of whitewater in my life. They both told me a HUGE storm was approaching and would last the entire week. The rain was just a steady drizzle as I approached my first big daddy of the day. Horn Creek Rapid (8) always has a strange feeling to it as you row the flat water leading up to it. I scouted and felt confident. Right to left move. The run went perfect. Next was Granite Rapid (8). One of the many rogue waves in it knocked one of my oars out of my hand. I continued on without mishap. Hermit (8) was next and was really just a huge wave train that kept my full attention but went smoothly. Down stream was the infamous Crystal Rapid (9). I ran right of the holes then moved left of the island. I had perfect runs on the day that really counted! The rain continued to intensify as I went through the Gems. The last biggie of the day was Serpentine Rapid (7) and it was huge but I made it through with no problems. My adrenaline was off the charts at this point. I had run all of those rapids alone with nobody around. When I finally rolled into camp at Parkin’s Inscription, I felt like a drowned rat. It was windy. It was pouring down rain. I was starving and shivering from cold and the clincher was that I had to unload the boat and set up a tent and get changed before starting up the stove and getting some warm calories in me. I was high as a kite on adrenaline while at the same time deeply wasted from the effort and weather. My body and mind were really confused, but I was still smiling and I was extremely happy with my day. After sleeping soundly through the stormy night, I awoke to a break in the weather and decided to go for a hike. I ran into a couple of guys on my hike who were camped at Lower Bass. They said they had flipped their dory in Crystal two days before. 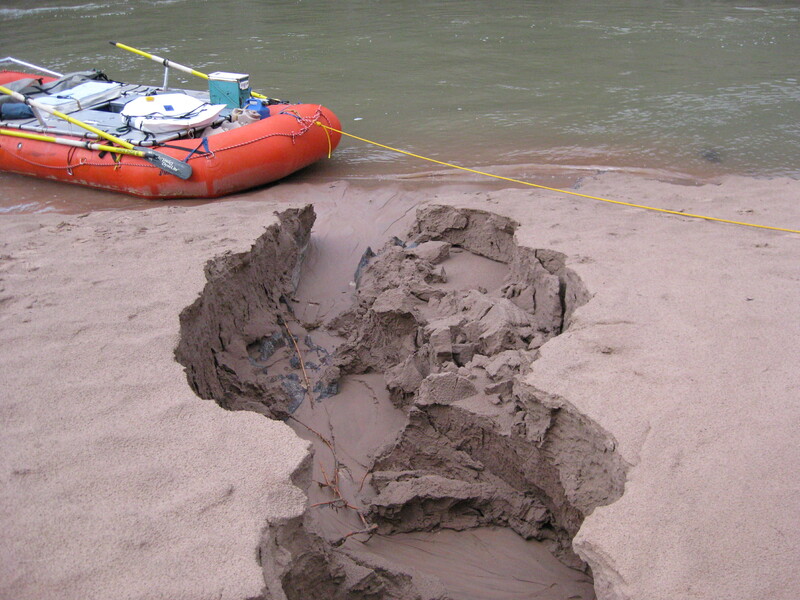 The dory was damaged after crashing into the rocks on the island below the rapid. The following day, another group pulled into the eddy at my camp and informed me that they had flipped in Hance, Horn, and Hermit. They were all river guides from Montana and Colorado. This just reminded me that flips can happen anywhere and that I needed to remain focused at all times. I stayed at Parkin’s Inscription for six nights. The storm system brought heavy rain and the river rose a couple of feet above the normal high mark. I knew I had better just wait it out there and let the monster pass. I had my boat tied to six different anchors during that week to ensure it stayed put. 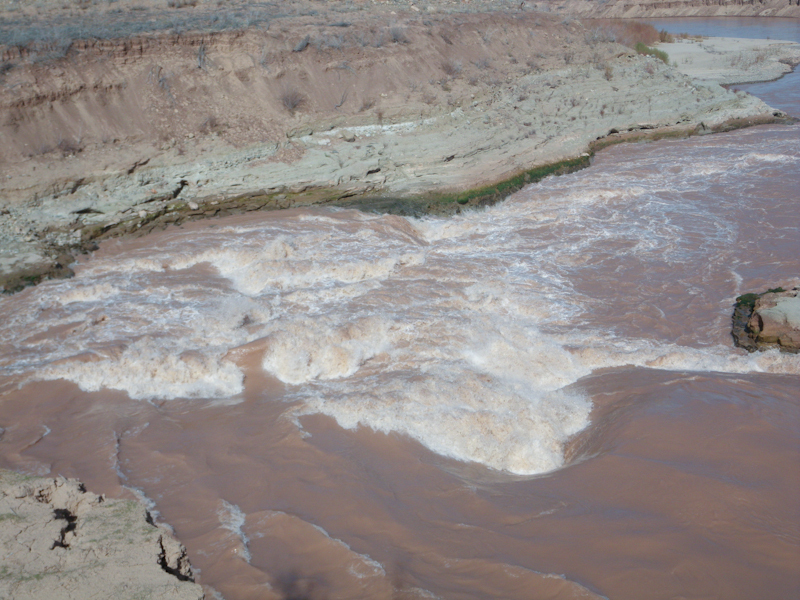 I made a habit out of continually checking the anchors every few hours as the beach was eroding away from both the runoff at my camp and the high water on the Colorado. The next big rapids were Specter (HUGE wave train at that water level), Bedrock, and Deubendorff. Deube scared me the most and I scouted for over an hour trying to come to terms with it. I finally felt good about it and ran it with no problems. I pushed hard on the oars all day and made great progress. Next up was Upset Rapid. It was very late in the day and I gambled with running this one so late. A flip could be less than desirable after a 30 mile day on the water and cold darkness right around the corner. I ended up running dead center in the huge hole instead of skirting right. I committed early enough to push hard forward a few times to punch the hole. My 18 foot raft disappeared into the white froth but we came out the other side simply soaking wet! I arrived at camp just before dark and passed out in my sleeping bag under a growing moon. 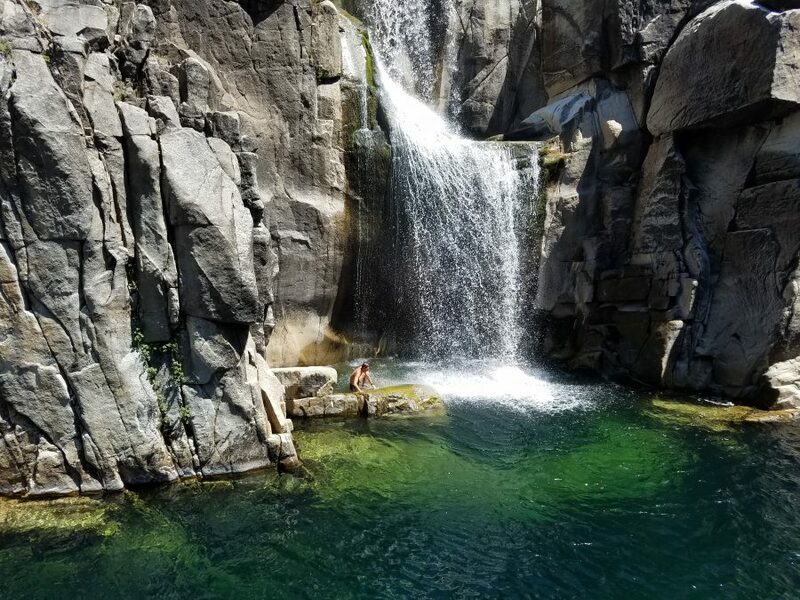 Another huge day on the water brought me to the calm water above Lava Falls. 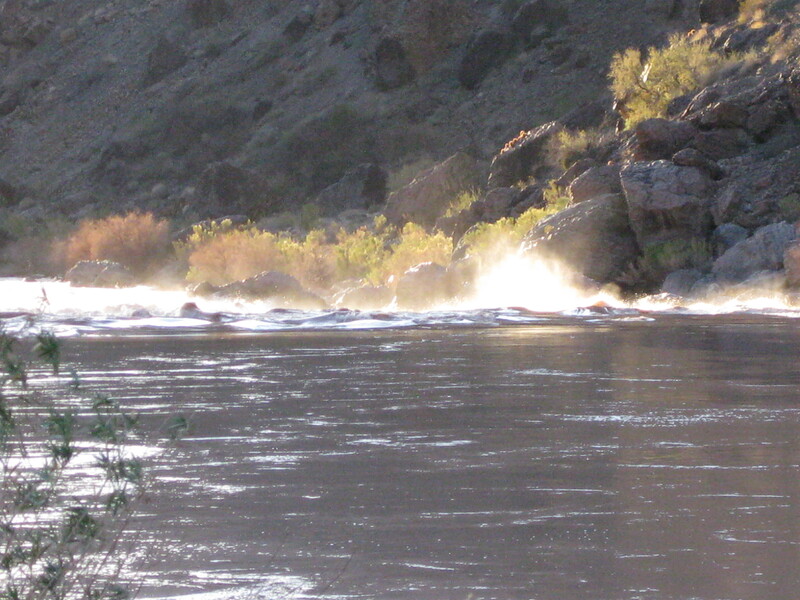 I could feel the power of the rapid more than fifteen miles upstream. It just kept building in my mind and throughout my body. As I approached the horizon line above the rapid, huge splashes of water would shoot into the sky and would light up from the late afternoon sun. I scouted and it looked like it always does…scary. I felt that I shouldn’t run it that late in the day and I camped just upstream. The next morning I looked at it again and my mind just wasn’t quite talked into running it yet. I went back to camp and listened to Eddy Vedder – Into the Wild album. Next thing I know I’m packing my stuff up and have the boat all rigged. I cruised down one last time to look at the rapid and told myself, “it’s time to run this thing!” I practically ran back to the boat and did one last check on my rigging. Everything felt right and after a kiss to the Lucky Duck I pushed off. A tail wind seemed to come out of nowhere and it just pushed me towards the blind horizon line. I hit my little marker waves perfectly and entered the meat within one boat width of the left side of Ledge Hole. I was pushing forward with all I could muster and hit the first lateral punch on my left side. I had adjusted for this punch just before I hit it and came out straight as an arrow. One more huge push forward and I hit what would be the largest punch of the trip. The boat disappeared before my eyes and before I knew it I was on the other side, upright, with both oars still in my hands!! After a few more huge waves breaking over the bow I was through. I activated the SPOT before I entered Son of Lava knowing that it would take another 15 minutes before it showed up on the computer for those following. I wanted everybody to know that I was safe and to try to share my almost overwhelming positive energy in ‘real-time’. I made a Sat phone call out to both Katie and Craig. I was on top of the world! It began raining lightly right when I untied the boat to run Lava and was slowly beginning to intensify into a steady down pour. I was glad the rain let me make the calls and video a little before unloading on me. By the time I reached camp (I think only a little over 10 miles below Lava), the wind had picked up and the rain was there to stay. I threw camp together and landed inside my tent. I couldn’t stop grinning. Lava Falls was safely behind me. The days following Lava turned out to be the most challenging for me. I had nothing to focus on. The most difficult (more on that later) rapids were behind me and I still had 13 days before my scheduled take out. I knew I could hammer the final 100 miles out in 4 days if I wanted to. Purposefully stalling out to endure the entire 29 days ended up being the icing on the cake. It was then that I truly felt the magnitude of my trip. On day 23, I successfully finished a yoga hand balance sequence that I had been working on for about 4 months. Things were just falling into place like I wanted them to. A blue plastic 40 gallon barrel was half buried in the sand around mile 222. 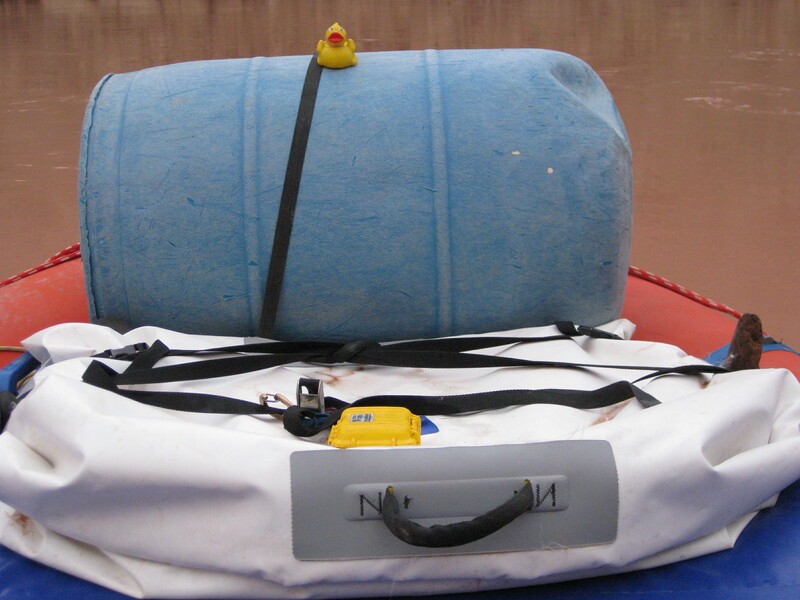 I dug it out and strapped it on to the front of my boat to be recycled at home. I named my new friend Blue. I hauled the mail with a couple of back to back 30 mile days and arrived at Pearce Ferry Rapid. This ever changing rapid looked the most severe ever. It actually looked more violent and challenging than Lava Falls. Wow! (I later discovered that groups were taking out illegally on the yet to be finished access road above the rapid because they thought the rapid was unrunnable after scouting it.) I had to regroup and go back to that place in my mind that I thought I was done with after Lava. It was again very late in the day and I knew I just wanted to be down stream of this one that same day. I scouted and prepared my mind for about an hour and a half and finally felt ready. I was really tempted to leave my sleeping back and tent at the scout just in case I flipped. Another two day storm was brewing and I needed to get this one under my belt. The Grand Finale! I entered the rapid on the far left and rowed hard upstream against the current. I tried to slow my momentum and not hit the bank that all the current was pushing towards. Everything was going perfectly and I surprisingly didn’t slam into the wall. Only one hole remained on the bottom left and about half of my boat ended up going into it and the other half stayed in the fast moving down stream current. The relief I felt making it safely through my last and most technically difficult rapid was like nothing I had ever felt. I had done it. I made it safely down the entire Grand Canyon alone. I had run every rapid alone and I trusted my instinct. I thought I could do it, and I did. Chris can sure write. And that was a beautiful piece about a beautiful trip. Thanks for sharing. Awesome post! 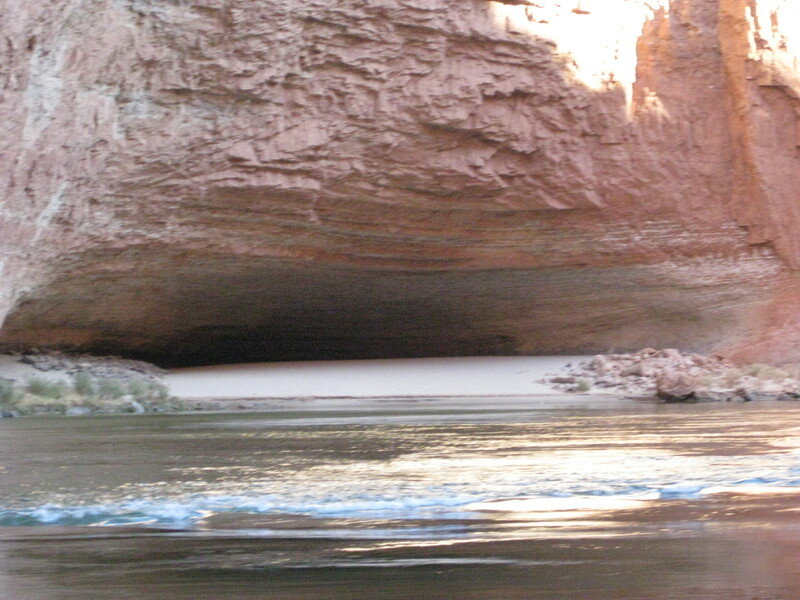 I’ve been through the Canyon on the river but only with 19 people and no oars. What a vastly different experience yours was. Thank you for sharing it. What was your total Sat phone bill? The Sat phone bill came out to something like $560. I think they must have raised the rates while I was down there! I was able to plow snow to work the Sat phone bill off. I’ve been waiting for this post – very cool, Chris! I remember enough of the rapids to feel a sense of what you were looking at – especially Horn and Lava. The Pearce Ferry rapid wasn’t there when we were last time – it sounds unbelievably tough, and particularly so when you aren’t really planning on that kind of thing at that point. Anyway, Jim and I are so glad that you were successful and found it the challenge you were looking for. Way to go. And thanks for sharing it with all of us. @Mel B., Olga, Deb, Mel, You are all very welcome. Awesome adventure, Chris! Thank you for sharing it with us! When Craig told me that you’d be bringing a gong down in to the Canyon, I had no idea it was going to be as big as it was. That’s an impressive gong, sir! You didn’t happen to get an audio recording of your playing did you? @hairclub, I did record some. The gong, however, is best felt. The recording doesn’t do it justice. It will be going to States so you can ‘feel’ it then. Wow! Congrats on an awesome adventure! Wow Chris! Thanks for sharing your experience. My heart was racing, and I have never even been rafting before! Congratulations. You are an inspiration and example of what it takes to accomplish such an adventure safely. The studying the rapids for such lengths of time shows great focus and appreciation of the inherent danger you were willing to face. Nice work.